State Rep. Eric Johnson, D-Dallas, renewed his call to take down the plaque, noting that the preservation board had never approved his request to do so. And any legislator can submit a form to request the removal of a “monument or memorial” — as Johnson did — and submit it to the preservation board, Paxton said. The curator of the Capitol, who works for the board, can approve the change — or the board has the discretion to do it itself. Ali James, the curator, did not immediately respond to requests for comment. Abbott’s didn't respond to a request to comment on Paxton’s opinion. But during a gubernatorial debate earlier this year, he indicated that the preservation board should not be the one choosing to take down the plaque. 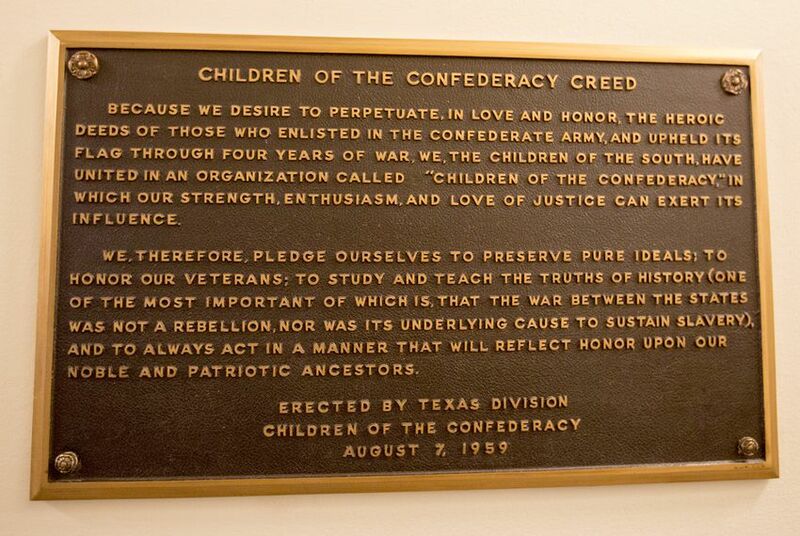 "This plaque was put up at a vote by the Texas Legislature. It’s the Texas Legislature with the responsibility to take it down,” he said. "Should they take it down because of the factual inaccuracy? Absolutely." Paxton said the Legislature could remove the plaque through concurrent resolutions, as it has done with other artifacts and monuments in the past. But outgoing House Speaker Joe Straus — who is a member of the preservation board — suggested there was no reason to send the debate to the Legislature.